I am about to share some stuff that are very personal to me. It’s going to be a very uncomfortable experience for me, and very possibly for you as the reader as well, but there’s a point to them, so I hope you’ll bear with me. We all have our little dramas in our head; as William Shakespeare put it ‘The World’s a stage and we all have our parts to play in it”. In our dramas, we never die and if we’re top of the world, it’s unthinkable that we will ever descend from that position. Life is so comfortable. For those who are suffering, the suffering is only momentary and it will soon come to an end. We’re short-sighted beings, always focused on the short-term and never giving a thought for the Eternal. But just three weeks ago, I watched my grandfather pass on and the fragility of our lives really hit home. My grandfather came from China when he was still a very young boy. He lost his father at a very young age, and never got the chance to depend on anyone for care and protection. My father told me stories about how he worked in the logging industry, sometimes having to pull logs just to earn a living. From virtually nothing, he worked hard until today he owned a number of assets. My granddad seldom spent anything and much of what he earned was invested for his family’s future. But because he had to be self-dependent, he never gave thought to the role of a higher being in his life. That last night I was at his deathbed, I watched him fight for his life, not for himself but out of an innate concern for the family that he was leaving behind. But there was also peace and this brought a more encouraging reflection to me. A few months before he passed on, my granddad had finally repented, said the sinner’s prayer, and acknowledged Jesus as his Lord. God finally took him home in his sleep, granting him one of the most peaceful deaths I have ever seen. Matthew 20:1-16 and Luke 15:3-7 rang so strongly for me that night. In my own life, I have also seen God’s covering and mercy over me so many times. In the last 5 years, I have been robbed twice at knife-point, but both times God miraculously delivered me, the second time without a single bruise and very minimal losses. Even my ministry writing full-time for God has His hand of providence upon it. Due to childhood experiences as an outsider, I grew up lonely, distrustful of strangers, and somewhat hating myself. Nearing my adulthood, I struggled for many years to find a purpose. God slowly moulded me, giving me challenges as opportunities for growth, guiding me the whole way. Never would I have thought in my earlier years that I would one day write for the King of kings and Lord of lords. I think we sometimes focus on the wrong perspectives in life. Take for example the accounts of visits to Heaven and Hell. Are these experiences genuine and how could a loving God torture people in that way? If you ask me the question, in all honesty, I would have to tell you that I do not know; only the person relating the experience and God knows. Maybe God does indeed sentence people to hell, exercising his prerogative as a holy God. Maybe it was due to certain decisions in a person’s lifetime that caused them to be eternally separated from God. It could even be that the only reason why the devil and the forces of hell are not overtaking the world is due to the covering of a merciful God. But I think this is beside the point. Perhaps God is trying to tell us something here, sending us a warning of the consequences of the way we live. Romans 8:28 assures us that God mean all things for the good of all those who love Him, and that should be our security. Instead of questioning and blaming God for the disasters and sufferings in this world, perhaps it would be better if we question ourselves about what God wants us to do about it. Instead of getting angry with God over events and things in our lives, perhaps it would be better to seek God, and inquire what God wants to instruct us, and about His plans and purposes for our lives. An article by Philip Yancey I read recently concerning Job and the riddles of suffering gave me much thought about the challenges in life. Few of us would ever go though the level of suffering Job went through, but the points for consideration Yancey gave, is applicable to all of us. 1. In Job Chapters 1 and 2, the subtle but important distinction is made that God did not directly cause Job’s problems. He permitted them, but satan acted as the causal agent. 2. Nowhere does the book of Job suggest that God lacks power or goodness. 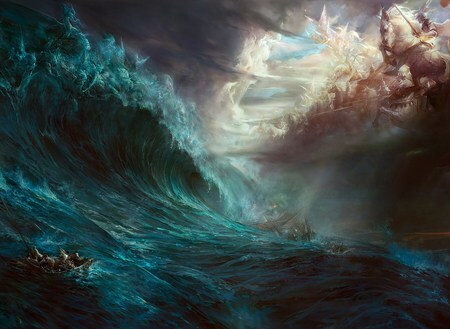 In the final summation speech, God uses splendid illustrations from nature to demonstrate that power. 4. God accepted Job’s doubt and despair and did not condemn them but only his ignorance. We can be open with God. The issue is not being honest with God about our emotions, but rather the hardening of our hearts. 5. No one has all the facts about suffering. Job concluded he was righteous but God was unfair. His friends insisted that God was righteous and Job deserved his punishments. None of them gave any thought to the battle in the spiritual realm. 6. God is never totally silent. Elihu convincingly illustrated God’s speaking through dreams, visions, past blessings and His daily works in nature. God similarly appealed to nature for evidence of His wisdom and power. 8. God refocused the central issue from the cause of suffering to Job’s response. The real issue at stake was Job’s faith; whether he would continue to trust God even when everything went wrong. 9. Suffering, in God’s plan, can be redeemed, or used for a higher good. In Job’s case, a period of great travail was used by God to win an important, even cosmic, victory. Only by looking backwards, can we see that through his undeserved suffering, Job gave an “advance echo” of Jesus Christ, who would live a perfect life, yet endure pain and death in order to win a great victory. Through easy times or hard times, God is there. It’s amazing that a limitless, omniscient, and omnipotent Being like God would initiate a relationship with flawed beings like us. It’s remarkable the amount of patience God has for us. It’s beyond astonishing that He loved us so much that He came down to make the ultimate sacrifice for us. But that He is so deeply concerned with our lives, that He would still involve Himself personally and daily in our lives, that is the most miraculous and awesome thing in our whole existence. My name is Caleb. Today, I had an incident of sinning against God, to me it is a very bad sin, a sexual sin. I wondered why had I ever had to sin against God repeatedly, I want to be strong in his grace, pastor of the church had preached about knowing that Christ had crucified for our sins, and I learned also in 2 Peter that God would help us in our trials as he protected Lot a righteous man, he can save us in our trials. As I went working, I desired a teabreak. I was prompted in the spirit several times not to head to where I was going to have teabreak at a restaurant. I did not care anymore, because I don't even know how to discern what I perceived. So, I headed to the location as desired, then when I came to realise that I did not have any money with me during the meal. Simply not enough to pay my bills. So, I decided to tell the lady boss if I can pay them later. Thankfully, yes was the answer (though not my first time doing it here). I went back to work and also in prayer that God to help me a sinner and have pity on me. I prayed several times. As I had in mind, a Christian lady who might offer to help me. I prayed to God in my heart just before I approach her. I say God, I am sorry for my sins, and ask for forgiveness for neglience and borrow attitute. (For it is not okay to borrow and borrow, even though you return the money, it's just not right. The bible teaches so.) Just help me. God did answered my prayer, the lady offered to help me as I explained things in detail to her. It was rather a delight to her to borrow me. I was thankful. I borrowed 5 ringgit from her. Immediately I rushed to pay my unpaid bills. On the way, running, I had an impression "all things work for good for those who loved him". Well, to me as I was trying to understand what it meant from God. As I read from this particular writer. It really means a great deal to me. Mentioning this, I had a Christian brother facing this issue as well, he had an grand-aunt who died today. That God had prompted in his heart that he should pray for her for the past three days ever since he heard the news from his grandfather. He is a young man. I would hear what happened to his grand-aunt whether she received Jesus or not even though she died. Life is precious I hope to focus more on praying for the lost and prodigals. And be very sure of our elect and calling not to fall away from Him. God bless you dear reader. May He make your business prosper. Amen.